Since the first day we opened our doors, we knew how important it was to introduce our students to not only playing an instrument, but to the art of performing on a stage, for an audience. Our students have always been given opportunities to perform on many different levels throughout the year. Performing is such a valubale tool and we believe in using it. In addition to inspring a student to practice, it also is a great way to teach a child the importance of discipline and professionalism when getting up in front of a group. Througout his or her school career and later as a working adult, everyone uses the skills they learn studying music. Adults who study at Risko Music are also as excited to be able to participate in these wonderful performance opportunties. In 2009 when we moved to our new space, we were proud to introduce students to our brand new performance areas which has enabled us to offer even more showcases.We also have increased the number of showcases we offer per year in order to provide students an even more authentic experience. Our in-house showcases are always free as we do not believ in charging a recital fee so it is included as a part of our lesson program. Although performing is an important part of playing an instrument, not all students wish to perform and although we encourage it and are a performance based school, we support the student who just wishes to learn to play an instrument for his or her own enjoyment. If you would like more information, please contact us or let us know if you would like to be a guest at an upcoming show. This is a picture of one of our earlier showcases in our old space. From inception, we have always believed that performances are really important for all music students. Sign up for our next Student Showcase below. Make sure to fill in all the fields. You will receive a confirmation email with more details about the show. How many people are you bringing to the show? Date of show you are signing up for? Everyone enjoys performing in our super cool space! Pictured here are one of our adult band workshops performing. 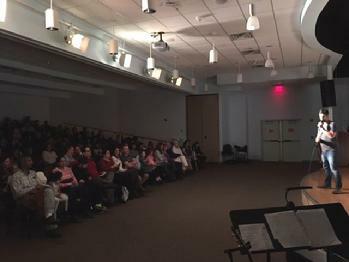 Our performances often draws such a large crowd that we have to hold the show in the local library theater!